ARLINGTON, Texas (AP) — Drew Brees didn’t have a completion until the final play of the first quarter. His final pass, one he was trying to throw away, got intercepted. 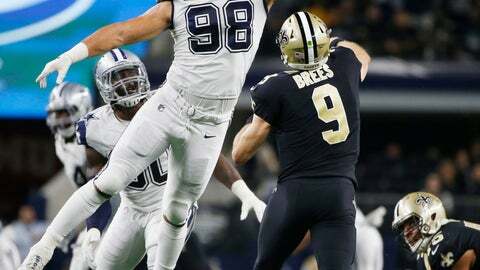 And things certainly weren’t much better in between for Brees and the NFC South-leading New Orleans Saints, whose 10-game winning streak ended in a 13-10 loss at the Dallas Cowboys on Thursday night. He finished 18 of 28 passing for 127 yards passing, including a 30-yard touchdown to Keith Kirkwood in the third quarter on a drive when two Cowboys penalties extended the drive — a defensive holding call on third down and a roughing the punter near midfield. Brees was held to under 200 yards for the third time this season, and second week in a row. The Saints (10-2) had their season low with only 176 total yards, and their fewest points in three years — since a 24-6 loss to Houston in Week 12 of the 2015 season. “We weren’t really good on the early downs. We didn’t have the balance that we’ve had in prior games,” coach Sean Payton said. “We struggled running the ball with any consistency, and we didn’t want to get into a one-dimensional game. “Some games you play where you don’t’ have a lot of third downs because you’re operating efficiently, but that was the case certainly in this game,” he said. Alvin Kamari had 72 total yards — 36 yards rushing on 11 carries and 36 yards on eight catches. His took a helmet-to-helmet blow from Jaylon Smith on a short pass when he was stopped short of a first down with about 10 minutes left. Two plays later, with Brees under pressure and trying to get rid of the ball, Jourdan Lewis made a diving interception — a play that was upheld on a replay review.